A number of strong Democratic candidates for president are entering the 2020 race, and Donald Trump is naturally trying to push back against them by resorting inappropriate and idiotic zingers. 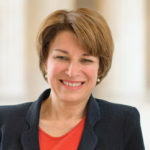 Senator Amy Klobuchar officially kicked off her campaign yesterday, and she reminded us of her toughness when she went through with the speech even after it began snowing at the outdoor venue. Trump thought he saw an opportunity. He was wrong. It’s becoming more clear how the 2020 Democratic candidates plan to take on Donald Trump. They’re going to hit him hard on the issues, such as climate change, but they’re also going to show no fear when it comes to firing right back at him on the personal stuff. After all, bullies like Trump always reveal themselves to be cowards once you hit them back with equal or greater force. We also need to keep in mind that Trump is more likely to be in prison by 2020 than in the 2020 race, so the Democrats could be facing some unknown Republican nominee.